Hantz Woodlands, an enterprise of Hantz Farms Detroit, signed an agreement in 2013 with the city of Detroit to demolish 50 vacant city-owned structures on the east side, plant 15,000 trees, and oversee the general maintenance and upkeep of the properties. Just over a year later, Hantz Woodlands has completed its mission, with 10 months to spare. The 54th blighted structure will be removed today at 9403 Schiller St., where Mayor Mike Duggan will present the company with a certificate of completion. “We’re very proud of the incredible momentum and excitement that has surrounded Hantz Woodlands in the neighborhoods and beyond,” says John Hantz, founder of Hantz Woodlands and CEO of Hantz Group, a multi-faceted financial services firm in Southfield. 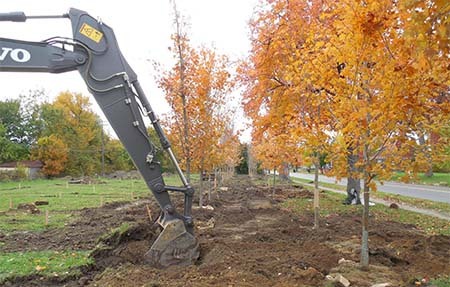 “The 15,000 trees that are now growing on the east side have fueled ideas, hope, and excitement among our neighbors, and spurred engagement with them around how we grow into the future. Hantz Woodlands worked for five years with the city of Detroit and invested more than $2 million before receiving approval to transform about 1,800 blighted lots into an urban hardwood forest, Hantz says. With the help of more than 1,000 volunteers, 15,500 trees were planted — 500 of them large sugar maples — while every 10 days the properties were mowed and cleared of brush. The brush was so bad that it was difficult to see from one street to the next, which impacted public safety and encouraged crime. In addition to removing the overgrown brush, illegally dumped trash was removed and remediated. For more information about the project, visit hantzfarmsdetroit.com.